"Without fail, Crest has been able to restore every destroyed designer dress and shirt I own to like-new condition." "If you need something STAT, they get it done fast"
"With a busy life, it's really difficult to commit to dropping off and picking up my dry cleaning on a regular basis. I love that Crest has consistent and reliable pick-up and delivery services." "They do a great job. The pickup and delivery has changed my life. I love not having to go get my dry cleaning anymore." "Been using them for 14 years. They clean the clothes in-house--no shipping them around town like some places. I don't have problems with my clothes disappearing like other places I have tried." "Crest is very gentle with my clothes and when I go to drop them off (with stains like mine you should), they review the garment with me and notate every stain and even discuss with me how they will treat it. They then review the material and let me know of any risks/dangers (if any) and ask if I want to proceed." "Everyone is so polite and courteous. They are always helpful with any request. The are very knowledgeable about tough stains and how to get them out." " If you want great customer service and clean clothes, Crest is the way to go." "I've been a long time customer and have nothing but positive experiences having them professionally launder my clothes." "I don't trust my clothes with anyone else." "They know who I am, they are professional, always friendly and helpful." "I have been using Crest for years and could not be happier. You always see the same smiling faces and they have my clothes ready for me before I walk in the door. The clothes NEVER have a chemical smell to them and always look great." "Their service and support has been outstanding and consistent throughout the years. They always have my cleaning on time and perfect!" "My wife and I have used Crest Cleaners forever! Never a problem, never a late item, always a smile and a "first name" hello!" "I couldn't ask for more. I hang the bag on the door on Mon/Thurs and it's back the following Thurs/Mon." " Do yourself a favor and find yourself a good cleaners like Crest. The few dollars you save in cleaning costs can be easily displaced by thousands in damages to your clothing." "Great service, incredibly nice people and a cleaner that respects your clothes. They come back sparkling and with all the buttons and no excuses." "I love the delivery service - it is incredibly convenient and helpful! And where as is the same day service hours so amazing!" "We feel very spoiled by the good service. The clever laundry bag that also doubles as a garment bag for the cleaned items makes the whole process very easy." "I rely on their same day turn around. Hasn't failed me in 17 years!" "Of all the dry cleaners I have been to in my life, Crest has all the things I've ever wanted. The feeling that I got when I first came here was similar to when I first bought an Ipod and stood in amazement at all the features that I ever wanted on a portable music device." "I'm an "organic" nut and I'm very conscientious about what I eat, what I breathe in, and what I touch, especially when it comes to carcinogenic materials. Perchloroethylene (Perc for short) is the cleaning agent used in almost all dry cleaners. That thing is highly toxic and Crest does not use it. " Oh no! You ripped your pants or lost a button on your favorite shirt! What’s the next step? Do you toss the item away or try to fix it? It’s always good to see if an item of clothing is salvageable before you throw it away. But then comes the question: Do you DIY it or give it to an expert to handle? Here at Crest, we believe that you should take the best care of your clothing so it lasts a long time. This includes alterations. If you’re unsure whether to trust an item to an expert or to DIY, always choose a reputable expert. However, there are some things that are simple enough to DIY yourself, even if you don’t already know how to sew. 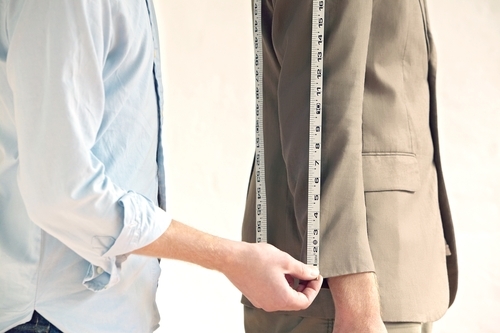 In this article we discuss when to take your clothes to a tailor and when to fix it yourself. Remember: In general, the more expensive the item, the more careful you should be. Don’t try to DIY an alteration on your $300 suit if you have never sewn before. These are easy sewing fixes—even if you’ve never sewn before you can look up a few tutorials and figure this out on your own. However, if you are unsure and you are dealing with an expensive or loved item of clothing, you may want to pay the tailor a visit. Provided that the tears are parallel to a seam or near to it, this is also a simple beginner fix. If the tear is perpendicular to the nearest seam, the solution is a lot more difficult. This tends to be a trickier area. Only very experienced sewers should attempt to alter the fit of the hips and waist on dress pants and even jeans. Especially around the shoulders and collar, these are tricky alterations and should be left to a reputable professional. For tops and dresses, bust alterations are also considered extremely complicated. We recommend you have a professional make this alteration. There you have it! We hope that helps you decide whether or not to go to a tailor. We know that it’s a tough decision. Here at Crest, we take the best care of clothes that come our way. We clean with gentle cleaners and also do alterations of any type! From missing buttons to suit alterations. Want to make sure your clothes fit right? Call us at 888-714-0070 or fill out our quick contact form today! You can also check out our alterations page, which shows all the locations you can get them at.